We are a custom tattoo studio located in Kuching, Sarawak on Borneo. 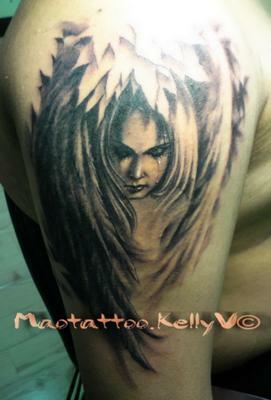 We provide you clean and custom tattoos, in a private tattoo studio. Please feel free to view our gallery at www.71stskinslavery.com or contact erickuehsy(at)yahoo.com for more info. Most people with body art are proud because the art has meaning or a story. Many of the people I know including myself are happy to answer questions or even sometimes explain why a certain art piece was chosen. So if you are curious ask, it could put your questions to rest. Just know that many people before getting tattooed had a lot of the same questions as you and generally will be happy to describe the procedure to you. As for if it hurts I would equate it to a sunburn, But each person is different and a professional artist can help you know what areas are the most and least painful. Join in and write your own page! It's easy to do. How? Simply click here to return to About Fantastic Malaysia. Malaysia's 1st fully disposable tubes and needles tattoo studio being open by KellyV, who have been tattooing since 2002. With 8 years of experience, she opened her own shop in 2010 near Sunway Pyramid. KellyV prefer creating custom designs, something that represents her style. Her favorite themes are fantasy, biomech and portraits. She likes something that's different and unusual!